Appleby-in-Westmorland is a town in the east side of the county of Cumbria / England on the River Eden. 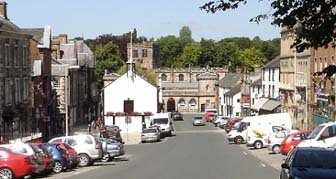 As the town is situated in the historic county of Westmorland, the council changed the name from Appleby to Appleby-in-Westmorland in 1974, to preserve the historic county name. 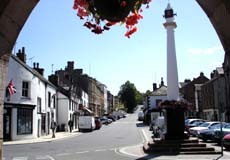 Appleby attracts many tourists for its scenery and the near-by North Pennines, Swaledale and Howgill Fells. The town itself has a popular river walk, hotels for meals, and bar/diners. 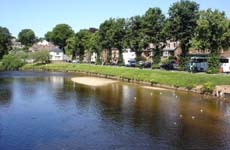 Next to the river walk are the Cricket Club image, Cricket Information, and the Appleby Pool image & Leisure Centre. St Lawrenc's Church dates from the 1100s. After destruction during the Border Wars, the church had to be rebuilt in the 1300s. 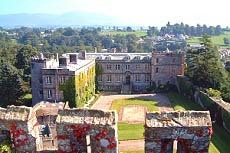 Appleby Castle entrance is situated at the top of the Boroughgate. The castle was built for Ranulf le Meschin in the 1100s. It was taken over by the Scots for a short time after the Scottish king William the Lion invaded the Eden Valley in 1174. The castle is privately owned, and now can be booked for tours, functions and weddings. Castle Website. The Appleby Horse Fair normaly takes place here each year in early June. The fair began in the 1100s, and still attracts travelling people from all over Britain to the town. The busy A66 road used to run through Appleby untill a by-pass was completed in 1982. The two main streets are the Sands by the riverside, and Boroughgate across the bridge leading to the castle.